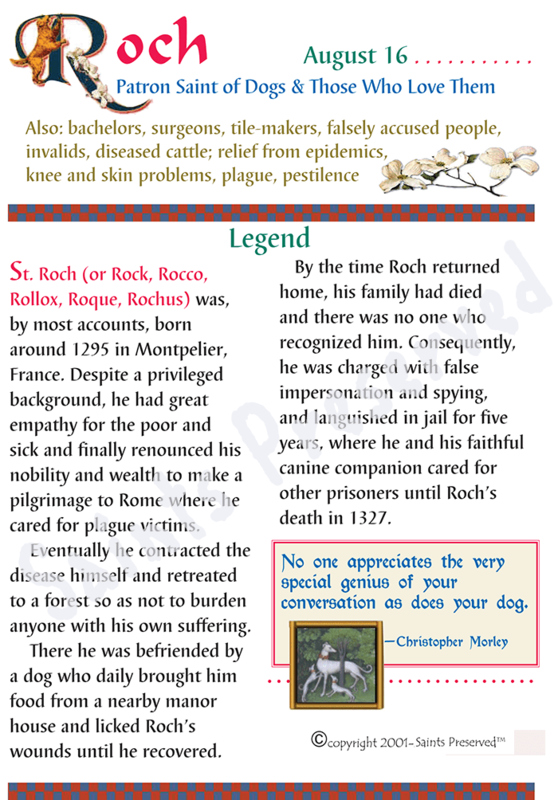 Roch (or Rock, Rocco, Rollox, Roque, Rochus) was, by most accounts, born around 1295 in Montpelier, France. Despite a privileged background, he had great empathy for the poor and sick and finally renounced his nobility and wealth to make a pilgrimage to Rome where he cared for plague victims. Eventually he contracted the disease himself and retreated to a forest so as not to burden anyone with his own suffering. There he was befriended by a dog who daily brought him food from a nearby manor house and licked Roch’s wounds until he recovered. By the time Roch returned home, his family had died and there was no one who recognized him. Consequently, he was charged with false impersonation and spying, and languished in jail for five years, where he and his faithful canine companion cared for other prisoners until Roch’s death in 1327. The “scroll” shown above may be purchased from our virtual gallery. Download to print it yourself…or have one of ours, on parchment paper, shipped to you. Have any sites or thoughts to share with us? Please let us know! Please pray for Marcia and for a good home for her dog, Mia. Marcia has welcomed plans to enter a nursing home soon but, she will have to find a loving new home for Mia (her name means “Mine, My own”).